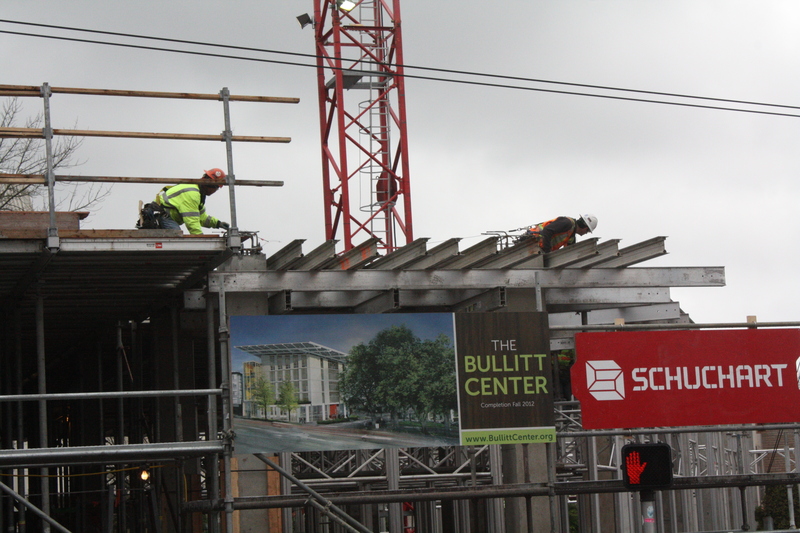 Last spring, CHS reported on an unusual swarm of development underway as construction cranes rose across Capitol Hill. With the completion of construction in sight, the business behind many of the projects is transitioning to a focus on leases and tenants. 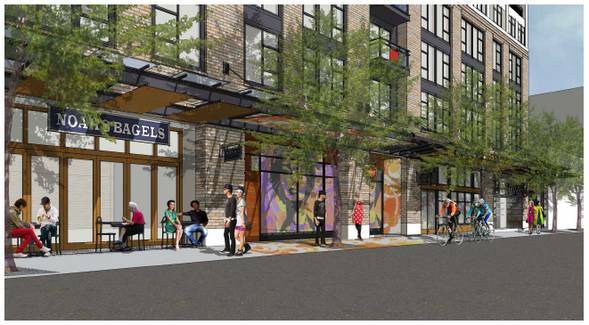 Here is a look at Capitol Hill’s next wave of development as the cranes comes down and the marketing plans go up. We’ll swing by some of the more interesting prospects for more in-depth looks as the developments progress. 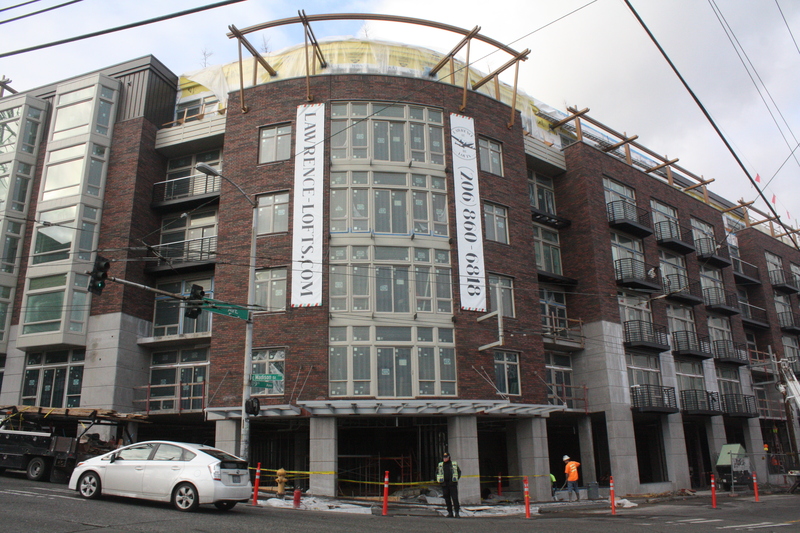 The development that signaled a new thaw for several frozen development projects on the Hill, the Lawrence Lofts are now almost fully cooked and ready to be served. After peering past all that plastic sheeting, I have to say it looks promising over there at 1818 E Madison. They’ve made some good choices with the interiors by saying yes to floor-to-ceiling windows and taking a pass on carpeted floors. You’ll find concrete floors on the 2nd and 3rd levels, and tile floors on all the rest. 131 lofts in studios, 1 beds and 2 beds with several 2 story penthouses on the top floor with private rooftop decks. SQFT ranges from 590 to 1439 averaging 757sqft. Prices range from $995 to $3195 and average about $1700. 129 parking spaces + 2 Zip Cars. 6 spaces with electric charging. The building has a large rooftop deck, community room & grilling center.Units have between 10’ and 18’ ceilings, feature concrete or tile floors throughout, stainless steel electric appliances, most have decks, solid surface counter tops, front-load washers & dryers, soaking tubs with designer tile surrounds, floor to ceiling windows. You can learn more at lawrence-lofts.com. We would like to announce that Banner Bank has signed a Lease for the relocation of their Madison Branch. They leased Suites A & B totaling approx. 2,700 SF. We are very excited to have them as our anchor tenant! There are three additional retail spaces available: Suite C; 917 sf, Suite D; 1311 square feet and Suite E; 934 square feet. We’ve seen your faces around the neighborhood. Caffeinating at Stumptown. Imbibing with a cocktail (or two) at Grim’s and Tavern Law. 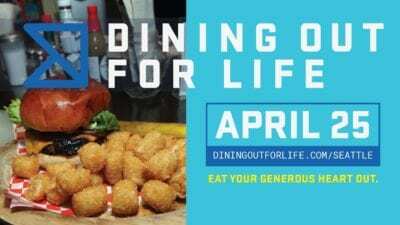 Chowing down at Oddfellows, Spinasse, or late night at Po Dog. Closing down Neumos and Havana. Dodging balls being hurled at you in Cal Anderson Park. However you roll, we’re looking forward to getting to know you. Help us put a name to the face. Dodging balls in Cal Anderson? You’ll fit right in. Listed rents run between $1,350 and $1,500 per month. Hardhat tours have begun if you are in the market. The behemoth of Broadway isn’t as far along in the marketing arena as The Citizen — the real estate people behind the project still hadn’t settled on a name for the building when we talked with them recently — but it’s on the road to completion in 2013 and starting the process of sewing up commercial tenants. 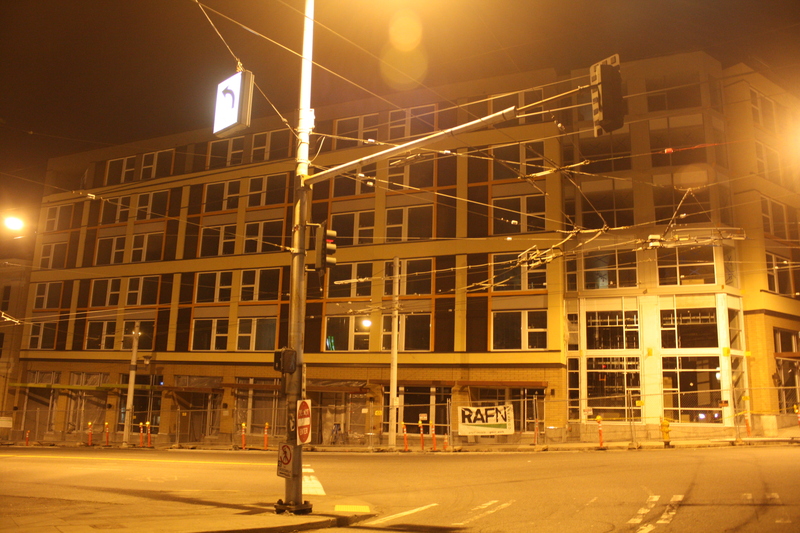 We detailed the start of development at the 230 Broadway location here. 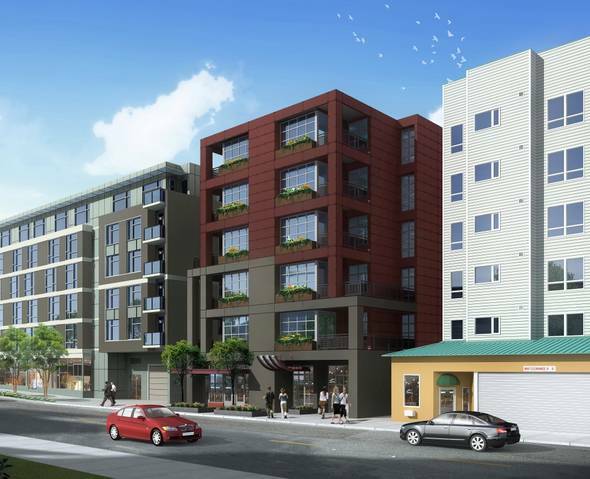 The building will introduce around 230 new apartments on Broadway — and a whopping 11,000 square feet of commercial space, plus another 5,500 square feet on Thomas. More than half that Broadway space already has a taker. Bank of America — displaced by the current construction — already owns its 6,000+ square feet in the building and will anchor the retail portion. Also already inked is an Einstein Bros bagel shop. The Noah’s chain’s main brand will apparently be applied to the store. You’ll recall that a Noah’s shop was displaced when demolition began on the project. 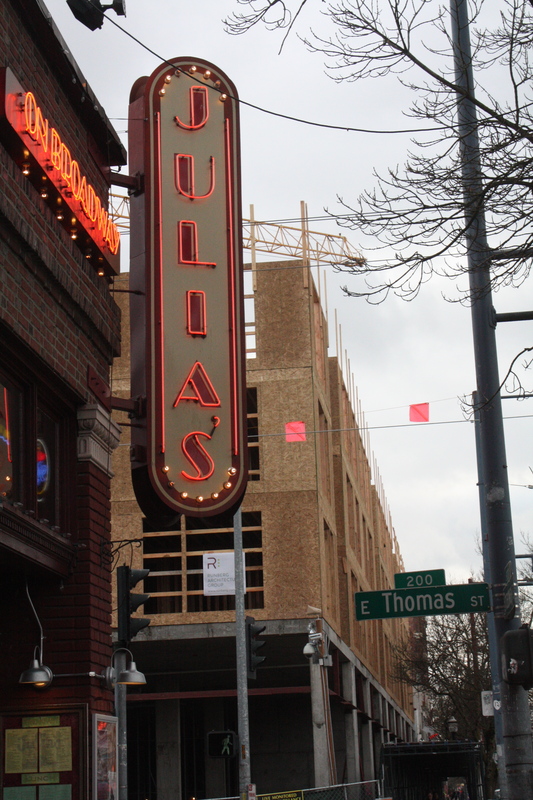 Joe Klaman of Russell Jones Real Estate said demand appears strong for the remaining Broadway retail space and that he is talking with some big names from the Seattle restaurant scene who don’t yet have a Capitol Hill presence. It’s possible — but not probable — that the building could bring eight new restaurants to Broadway. Each space is capable of hosting a restaurant-class kitchen hood, Klaman said. With demand high for Broadway frontage, Klaman also said he expects the best opportunity for smaller local businesses might be on the Thomas streetfront. The construction across from Central Co-op won’t include any residential or retail but the new building does give Jewish Family Service room to expand its efforts on 16th Ave. And it’s complete. You can check out pictures from inside the new four three-story structure on Facebook. We wrote about the $3.6 million project (UPDATE: That’s just the reported construction budget. Total project weighed in at $9.1 million, JFS tells us) when it began here last February. Watch for word of the building’s opening ceremony on April 1, 2-4p . 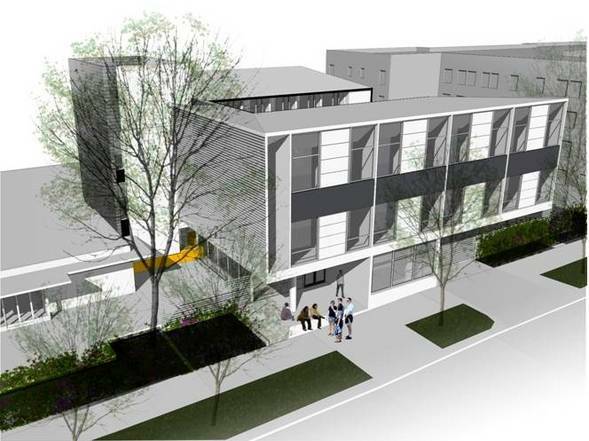 The University of Washington integrated design laboratory and Northwest headquarters of the Green Building Council are already slated to join Bullitt in the low energy building. Rogers said the UW lab will include offices for researchers, an exhibition area and a building science area. 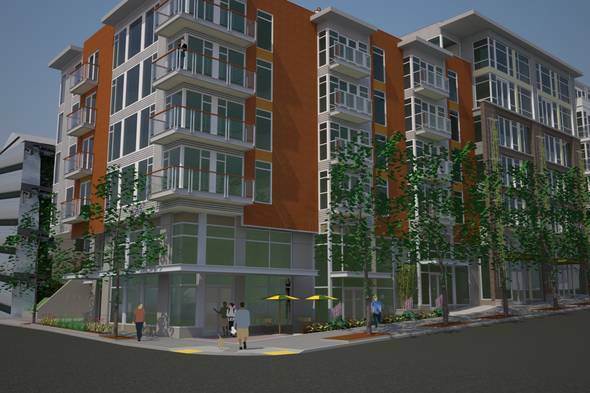 The Terravita is a mixed use building with 108 apartment units retail space available. Divisible down to 1,071 sf. 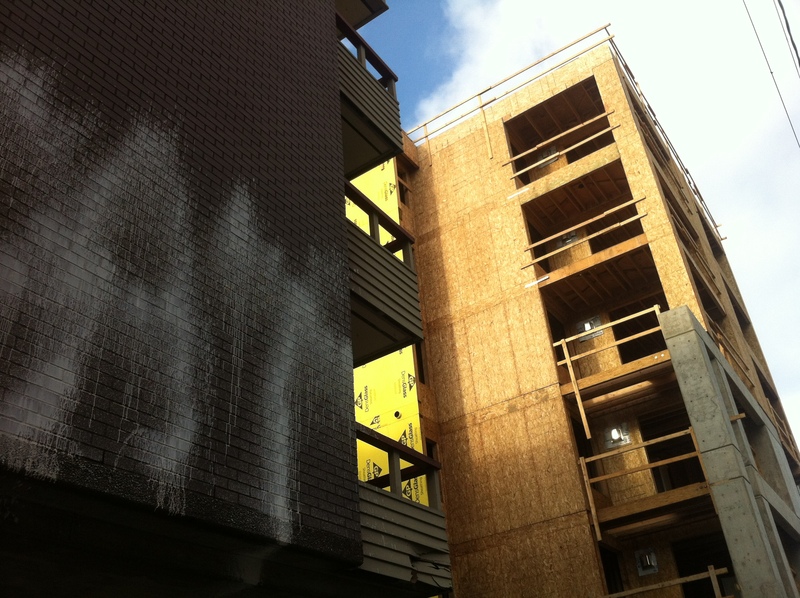 Scheduled for completion May, 2012, tenant work can begin in March 2012. 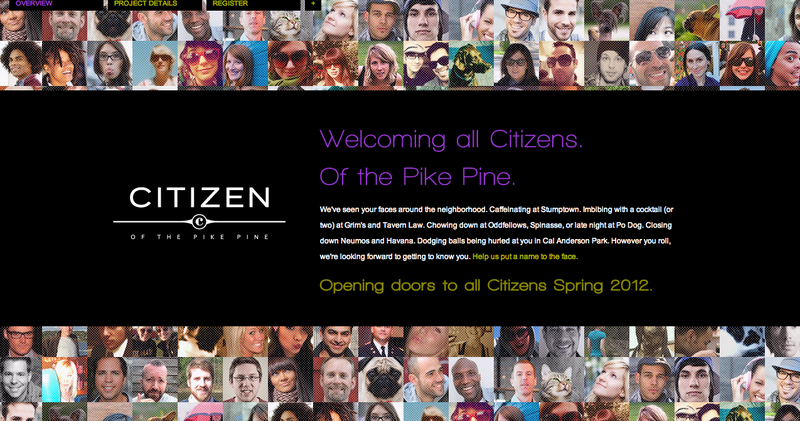 Located in the heart of the Pike/Pine corridor. Type I shafts located in each of the corner spaces. 25+ foot ceilings in the West Corner, 13 foot ceilings in the East corner. 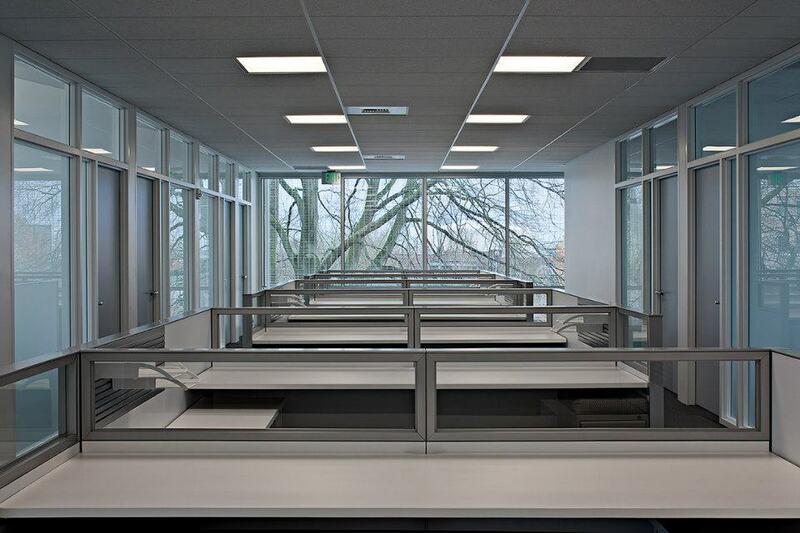 $28.00 – $30.00/sf/yr + NNN ($6.50/sf). The rep said the west corner space is of particular interest with 28-foot ceilings and room for an outdoor, enclosed dining area. Another possibility the real estate people are open to — a bar of a tavern in the middle space between the two potential restaurants. Wouldn’t it be great if one of these developments included an office supply place? Offering something between upstairs at the Broadway Market QFC and a drive to Office Depot. Yes! I went walking around Pike/Pine and went to 6 stores the other day trying to buy an external hard drive. It was completely hopeless. It is not necessary to drive to Office Depot though, one can just get on the 49 and go to the store at 4th and Pike, which is what I ended up doing. Surprised at the lack of comments. These building and their tenants will shape our neighborhood for years to come. And it doesn’t look good. Square, expensive and uninspired. 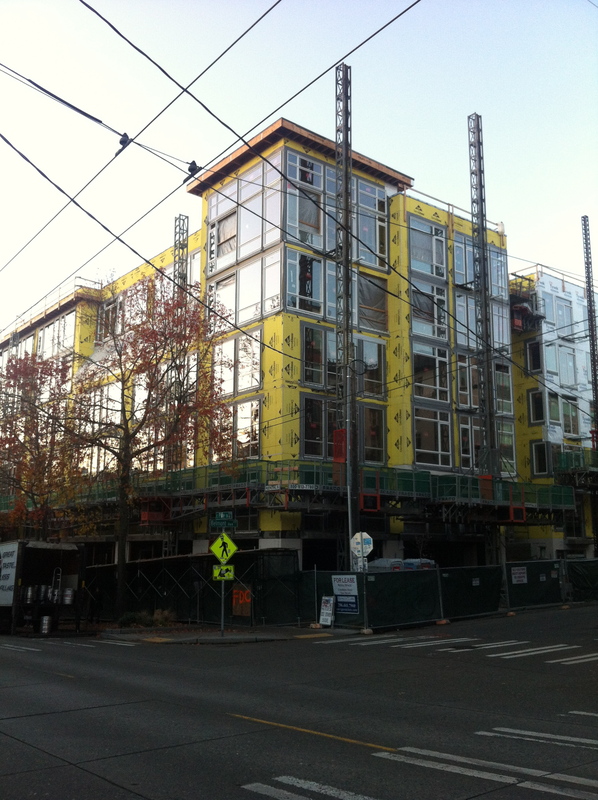 Capitol Hill will become hollow ground just like Belltown in 10 years. It doesn’t work Seattle. Try a little harder, residence and developers. The first one is trite. There’s plenty of houses on the hill. The second one is definitely much more expensive than these projects. I personally think that the Marion replacement and the Bellevue Terrace look terrific – exactly what the hill needs to revitalize itself. The white building next to the Belluvue Terrace is exactly the cheapo crap that needs to be torn down and replaced with more of the above. Still, what do you suggest in terms of not being boxy? I’m curious – don’t get me wrong, I would love to see playful architecture and don’t love the boxes either – but I just don’t see it as feasible for a lower price. All of this development on E Madison is great, but worrying due to the sorry state of E Madison St right now. The stretch of E Madison from Broadway to 23rd was not designed for density, pedestrians, bicyclists, or the urban atmosphere of new developments. Some of the people who move into these new developments will die because of the sorry state of Madison – just a fact based on the statistics of this street. – Fix crosswalks so it doesn’t take up to 5 minutes (literally) to cross the street. – Complete the street with bike lanes, center turn lane, transit features. – Traffic calming, such as more frequent traffic light changes, stop signs, etc. I know many if not all of these changes were included in the sadly rejected car tab increase, but Seattle really needs to find another way to fix these deadly outdated streets which are getting more deadly with new development.